Pic 4 shows the same main tramway (on Floor C) from Pic 3 where it emerges into daylight enroute to the main pit. The tunnel to here has curved northwards from the adit entrance and entered an opened chamber that has also been infilled with waste held back by a huge packwall. 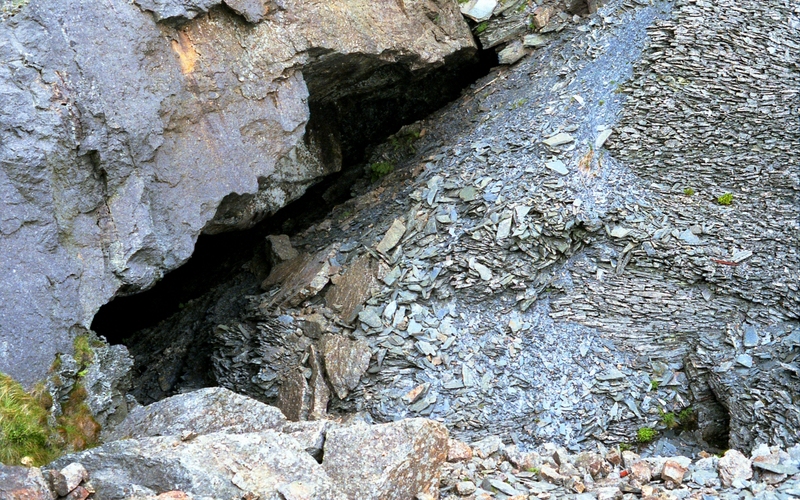 Note the block lined tunnel (bottom right) under the waste. Also just above here is another adit (Floor A) that has been quarried away, leaving part of its route as a marooned ledge. While the women waited patiently, my brother and i explored underground, eventually returning to daylight through the main adit into the large (northern) pit. Note the rails still in situ - infact a lot of the underground workings still contain rails even today, plus several wagons - including a much photgraphed one marooned in water. 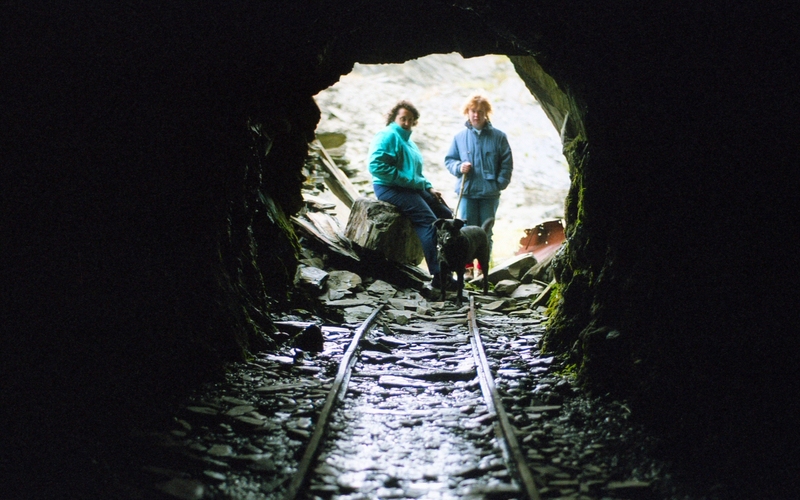 As a footnote the dog was Ben and throughout his life he explored many quarries - above and below ground - much to the surprise of anyone he bumped into deep underground! Nowadays i have 2 labradors who carry on the same tradition. Inside the main pit and looking back towards the exit adit. 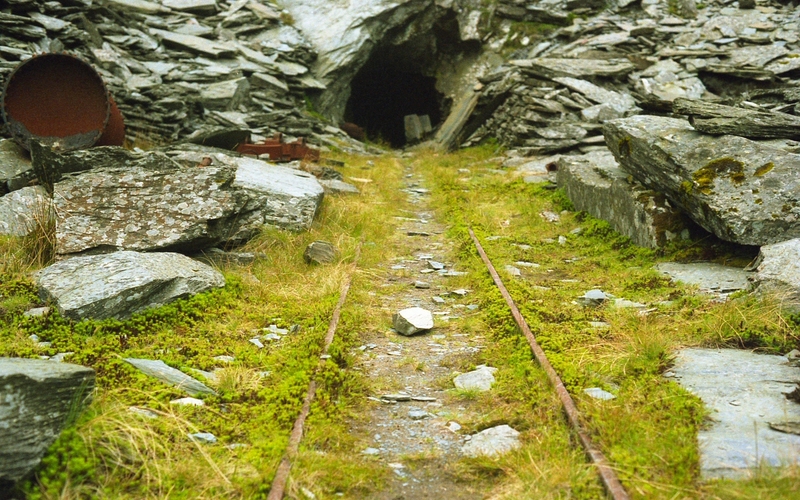 In later years internal combustion locomotives worked these rails from the pit to the mill (but only smaller locos could fit through the adit) and at least one of these* worked the Rhiwbach Tramway (from Cwt y Bugail to Rhiwbach #3 incline) after it was truncated following the closure of Rhiwbach quarry in 1953. Note another wagon carcass (left of adit) and the rusting cylinder. *A Ruston and Hornsby diesel loco did most of this service up to 1961 (when production proper ceased here) and this last stretch of the (upper) Rhiwbach Tramway also then closed.